The absolute best way to see Glasgow! Explore Scotland’s most populous city with the City Sightseeing Glasgow Tour. 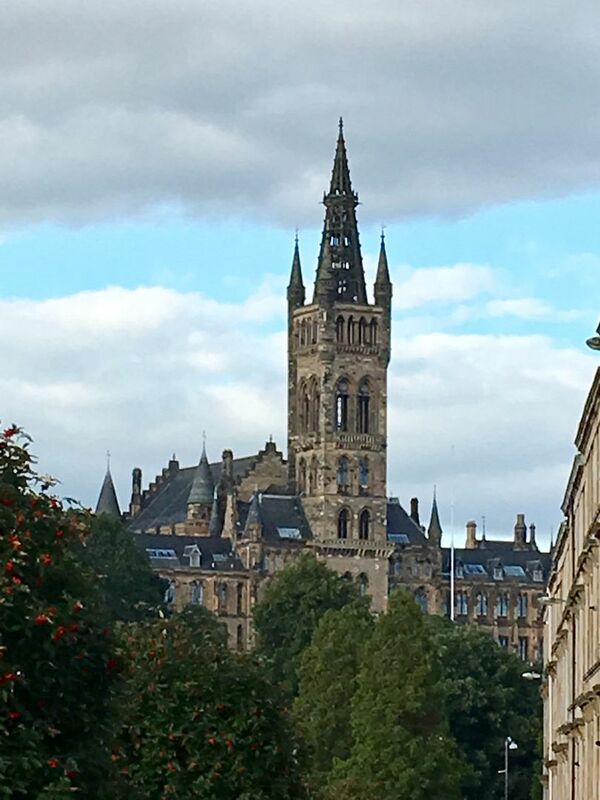 The easily recognizable, red, double decker buses take visitors through this Dear Green Place (the Gaelic translation of Glasgow), narrated with live commentary (or recorded multilingual commentary in 7 languages) and the opportunity to hop on and off at 21 stops, such as the University of Glasgow (see picture above), the Riverside Museum, and the Glasgow Necropolis. A special shout out to our guide, Campbell, who was exceptionally good at providing us with loads of information about the first city in the UK to be designated as an UNESCO City of Music. We learned that Glasgow lays claim to many distinctions, notably: the oldest modern-style municipal police force in the UK (established in 1800), the tallest cinema in the world (18 screens over 9 levels, seating more than 4,300 people), the oldest surviving music hall in the world (the Britannia Panopticon, built in 1857), the longest bar in Europe (104 feet 3 inches at the Horse Shoe Bar), the busiest bridge in Europe (the M8 motorway that crosses the River Clyde at the Kingston Bridge), and the tallest fully rotating freestanding structure in the world, in which the whole structure is capable of rotating 360 degree (the Glasgow Tower at 417 feet tall). To make the most of your time in Glasgow and discover all that this amazing city has to offer, check out the City Sightseeing Glasgow Tour! Privacy | Terms © 2012-2019 1522.com, Inc.